As we segue from the season of counting our blessings to the one focused on gifts of love, I can’t help but think of my friend Heather Roach. By day, Heather teaches school at Jere Whitson Elementary. The rest of her time is spent taking care of Henry, her husband of 12 years. He was in a deep coma. For fifteen days, Heather sat by Henry’s bedside in the trauma unit at Vanderbilt Hospital, holding his hand and wondering whether the next breath he took would be his last. Before he could receive a much-needed shunt to control the fluid on his brain, Henry—still comatose—was inexplicably transferred to another hospital and then to a nursing home where the staff had never cared for a patient with injuries as severe as his. Through it all, Heather stayed by Henry’s side. She talked to him. She read to him. She sang to him. She begged him not to give up. She reminded him that he was only thirty years old and had a promising career as a graphic designer ahead of him. She fought to get him the care he needed. Finally, Henry was accepted at the Patricia Neal Rehabilitation Center in Knoxville. Under the care of outstanding doctors and nurses there, he weaned himself off oxygen and was able to have his tracheostomy removed. He received the physical, occupational and speech therapy he so desperately needed and after three months was discharged to go home. But it hasn’t been a bed of roses since then. More than six years after the accident, Henry still has a feeding tube and is confined to a wheelchair. Though he can speak a few words, he’s considered nonverbal. The right side of his body is very weak and he’s legally blind in his right eye. He requires round-the-clock care. When Heather shared her story with me several months ago, I began to look for ways to share it with others. 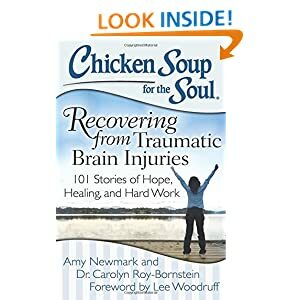 Because I’m a regular contributor to the “Chicken Soup for the Soul” series, I suggested she send it to a “Traumatic Brain Injuries” collection the editors had in the works. Happily, they bought the story and paid Heather 200 dollars. She deposited that money in a very special account—the “Build a House” fund started for Heather and Henry by friends several years ago. The house they’re renting now isn’t handicap-accessible. And it’s in a neighborhood where Heather sometimes doesn’t feel safe. Family, friends and community members are donating time, labor and materials to build a home for them that will meet current and future needs. The other way I’m sharing their story is in the column you’re reading right now. If you’d like to purchase “Chicken Soup for the Soul: Recovering from Traumatic Brain Injuries,” Heather has several copies for sale. When purchased directly from her, proceeds will move Henry and Heather closer to the dream of home ownership. You may contact her at heatherbdee@gmail.com or her mother Pam at (931) 528-2896. I can’t think of a better way to show a little love here at Christmastime.